I came up with the idea last night (during that amazing time at about 3am when you feel really creative...that's when I have creative bursts anyway!) that I'd love to do a series here, with outfits inspired by my favourite films. Outside MessyCarla, I am predominantly a Media student, and film is one of my major passions in life. So I thought to start us off, I'd go with my favourite film of all-time: A Clockwork Orange. Despite being a huge fan of films previously (my dad has taken me to the cinema since I was about 4-years-old), when I first watched this when I was about 13 and it completely changed everything - a film had never made me both disturbed and mesmerized before! 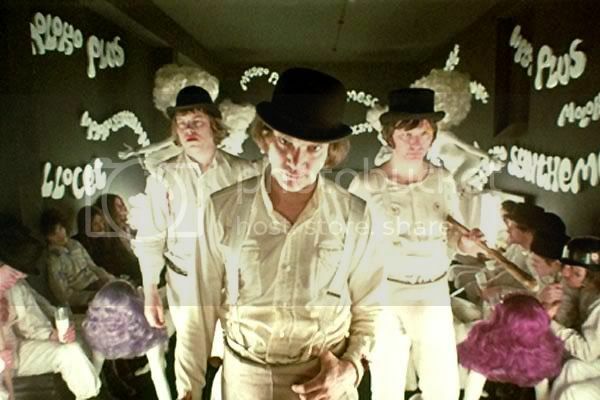 I wanted to know everything about it; not just about the stars - but how it was made; the meanings behind the cinematography, where the strange language the droogs speak ("Nadsat") originated, the ideologies about the strange story. Film for me was never the same again. I've said in previous entries that things like music and film have inspired my dress and for A Clockwork Orange, this was definately true. 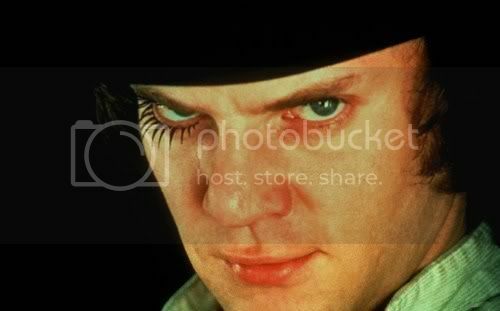 I bought a vintage bowler hat with my savings, and when I'd meet my friends in town on Saturdays I'd paint a fake eyelash onto my right eyelid, just like the main character, Alex DeLarge. My mam was a bit weirded out that I was "obsessed" with such a controversial ("and OLD") film at such a young age, but as I pointed out - it was healthier than being a 13-year-old who hangs around the park drinking cider and smoking! I've definately feminised the original outfits of cricket shirts and codpeices. And instead of walking canes with knives hidden inside (which is, frankly, rude), I've given you a fabulous bag instead! FAKE EYELASHES: Boots, from £1.99. EYELINER: Barry M (in 'Black'), £4.50. I'm currently putting together some ideas for other films I'd like to include in this series. But first - over to you guys! Have any films inspired the way you dress? I'd love to know, so either comment here or email me. I ALWAYS read them and respond! I take a little inspiration from pretty much all of the films I watch, haha. I also like Shiloh Wallace's clothes in Repo! The Genetic Opera (I went out and bought two cameos the first time I watched it) and Sweeney Todd (mainly men's period fashion. I have an obsession with cravats and waistcoats). i've definately been inspired by films before but also music (i used to dress like robert smith) and even books. However i often see things i like in films so much i will make almost exact replicas of their clothes, for instance Cher's amazing pink spotty dress from mermaids. Stephanie: ME TOO! It's really bad how few 'new' films I watch as I do a Media degree. Especially now I'm majoring in Radio instead, it should give me more time to watch films for pleasure instead of study. I saw A Little Princess when I was young and loved it, such a magical film!! Jacinta: I LOVE your post, and Ghost World is going to be one of the other films in the series. I AM Enid, it's super-scary! Nattie: I still haven't seen Breakfast At Tiffany's even though it's been recommended to me SO much, I'll have to check it out I think my mam's got it on dvd. And you people are GOOD at guessing - Repo post is one I'm considering for the series, and I bought cameos and bows too after seeing it! My friend Sam looks a bit like Amber Sweet! :) I liked Sweeney Todd too, and I'm not usually a Tim Burton gal! Lillian: Yep, me too. It definately weirded out some of my family and friends. I met Malcolm McDowell a few years ago and was so giddy and geeky, but thankfully he was a complete doll! And still with beautiful blue eyes! Haha, I definately still have issues with Lime Crime, but their lipsticks have grown on me. Their eyestuff is definately not impressive at all though.